For the runner on the run: Best running- and jogging routes, great hiking trails and walking tours, all in great locations! For more running routes, see Routes List. Having grown up in Florida, I was prepared to hate Las Vegas: a giant tourist-rip-off full of tacky amusements in what was once a beautiful piece of nature. I'd seen too much of that already. 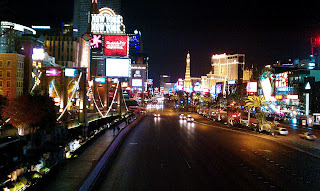 But somehow, I can't help loving Las Vegas, too. It's just a place full of fun-loving, normal folks, just out to have a few interesting nights-out. Everyone is pretty relaxed and good-natured about it, the shows are great, and some of the developments, like the Aria Resort, are beautifully done. Even if a lot of other stuff IS pretty tacky, what the heck. A more immediate problem for runners, and all other pedestrians, is that Las Vegas is definitely NOT very pro-human in its transport system. Every second street corner along the southern Strip totally lacks a pedestrian crossing, and you have to go up high stairways to cross the cars from above. One such pedestrian bridge ended abruptly at the entrance to the Treasure Island casino, and I just kept running inside, past the slot machines to get back out to the street. The same thing happens at the Belaggio, the hotel of hotels in Las Vegas. 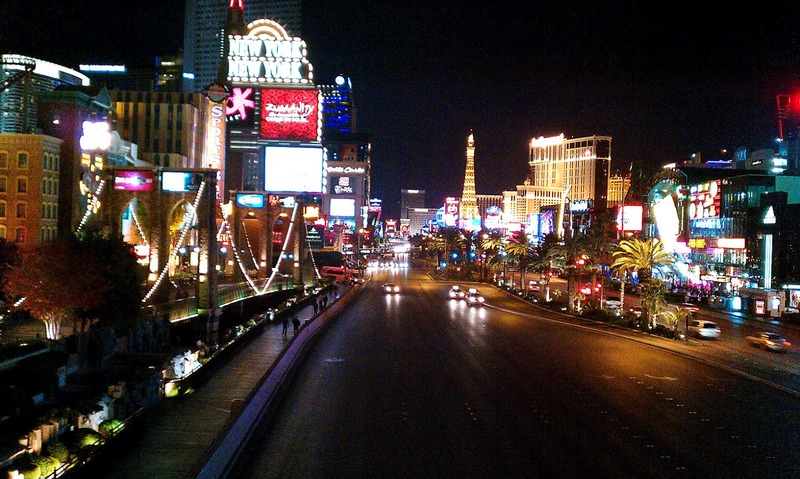 So, if you can handle that, then a run along the Strip during the cool mornings is just the thing to balance the crowds and blinking lights that will surround you this evening. NOTE: see the Destinations Tips page for tips about spending your free time in this great town! Otherwise, there are no real parks or quiet streets to run in the town center: the freeway of I-15 blocks access from the west, and the only park-like spots are fenced-off golf courses. NOTE: If you have a car and free time (I had neither on this trip), you can drive 20 miles (30-km) west, out to Red Rock Canyon and run/hike in glorious nature. I would definitely try this, if possible, so see the link to the Red Rock run! 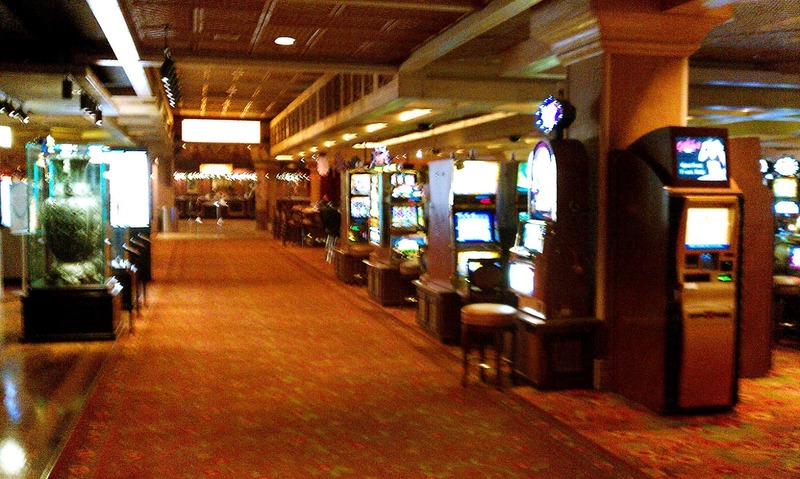 Most of the big casinos and hotels are on the south end of the Strip (Las Vegas Boulevard) nowadays, so that's where we will start this run. And because there is hardly anywhere else interesting to run, we'll just do a simple run up and down the street. I have to say, this is an interesting street. And this is where just about everyone runs in the mornings. We'll just regard the various pedestrian bridges as hill work. We have to start somewhere, so we'll do it at the corner of Tropicana Avenue and Las Vegas Boulevard, where a lot of hotels are bunched up: the Tropicana, the MGM Grand, New York New York, Hooters and the Excalibur. We'll just run north, up one side of the Strip and back south down the other side. NOTE: I assume that if you are there in the abundant hot weather in the summer, you'll have enough sense to run in the early mornings to avoid heat-stroke. We'll try to take advantage of the spots where hotels have added some landscaping away from the street to enjoy a few quieter spots along the way. Starting at the giant lion in front of the MGM Grand, on the east side of the street, we'll take off. With the Manhattan skyline and Statue of Liberty across the street, as well as a Brooklyn Bridge without Brooklyn, off we go. We'll pass the Hawaiian Market and the Harley café, with the gargantuan City Center project on the left. 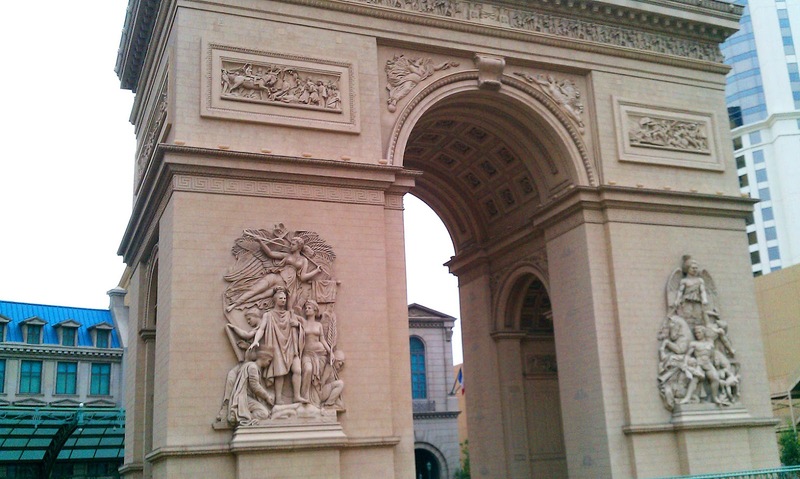 After Paris and its Eifel Tower and Arche de Triomphe, you'll see a landscaped courtyard in front of the Bally Hotel, with the fake waterfalls. Do a short loop there. Then you'll have to run up to the first pedestrian bridge, over 10-laned Flamingo Road. Then you'll find yourself running beneath pink billboards at the Flamingo Hotel touting the Donny and Marie Osmond Show. Hey, aren't they about 85 years old now? They must need the work to pay for the monthly plastic surgery. The majesty of ancient Rome at Caesar's Palace is evident across the street, with its Colosseum and the Forum. A block later, and Venice rises up on the right side, with a simplified version of St. Mark's Plaza, but strangely lacking the canals. And, in my eyes, even more majestic is Jimmy Buffet's Margaritaville, blaring out my kind of music. We'll just keep running north to Circus Circus Drive, cross the street there, then run back south again. But you could really turn around anywhere you feel like it, of course. If you continued northwards, you'd run through the northern end of the Strip, where the old downtown gives it a feeling of the old Las Vegas of the 1960s, with fewer gigantuan projects (find the downtown route here). And at Caesar's Palace, the Bellagio and New York New York (run over the Brooklyn Bridge) you can run a bit away from the street through their landscaped property. And once over the Brooklyn Bridge, you're back at Tropicana, and the end of this fun and interesting run. whats the distance of this route in miles? It's 5.3 miles. I always write the milage distance directly after the km (in brackets). Have fun in Las Vegas! I was prepared to hate Las Vegas: vegas a giant tourist-rip-off full of tacky amusements in what was once a beautiful piece of nature. Thank you so much for doing this. I am going to Vegas soon and I will try your route! Thank you very much for this info! I'm heading to Vegas for work for the first time and need to get in about seven miles today. It's great to know what to expect in sights/safety. Thanks for the route description. It served me well. did you feel you had to stop at a lot of intersections on this route? if so, are they any alternative routes around the strip area? thanks! Well, there are pedestrian bridges over almost all the intersections, so there is an occasional stair-climb. If you don't want that, maybe try the route out to the University of Nevada: http://www.joggingroutes.org/2010/12/las-vegas-university-of-nevada-usa.html Good luck! Just come back from Vegas and I ran from the MGM Signature around the back and up the strip to Stratosphere and back. I got caught at that same stairway bridge that abruptly ended. It was a 17km run. I started at 10.30 am and it was definitely too late as it was seriously too hot. Lots of interesting things to see along the way. Usually I have music but decided to turn it off so that I could soak up the atmosphere. The stopping and starting and waiting at traffic lights in the heat got a bit much in the end but I enjoyed the staircases in between. Overall highly recommend it. It gives you a great sense of bearing too. We ran this route today, starting from the Cromwell and heading North to Circus Circus. We turned around and stayed on the same side of the street, because there is construction on the western side of the streets. We started at around 6:45AM, and the temperature was great. There were some people weaving their way home, bottle in hand; but there were also many other runners and walkers. 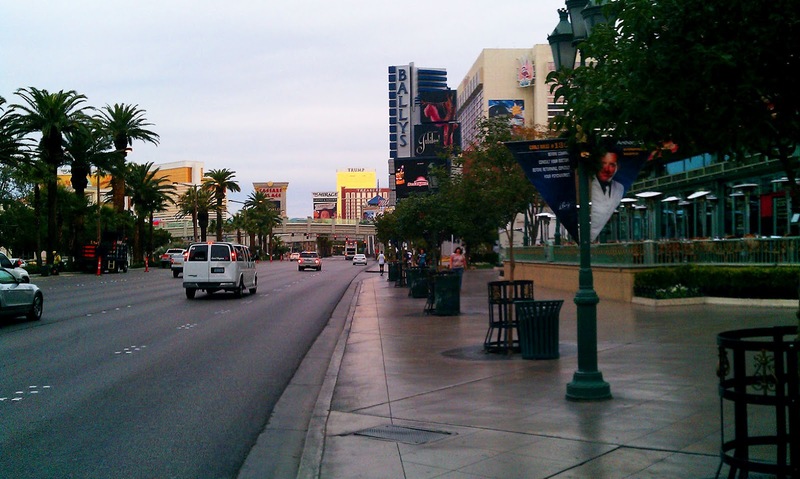 This running route gives you a great overview of The Strip in the gentle morning light. In the hot months, the early morning is definitely the time to run. Glad you enjoyed it, and keep on truckin'! Is a morning run on the strip fairly safe for a female solo runner who uses a lot of common sense, street smarts and no music? I've run the strip for years on my annual trip to LV. Thanks for the route description. I see the escalators, shortcuts thru casinos as enjoyable parts of an obstacle course. Thanks, this is perfect. I'll be in Vegas next week and staying a block away from Tropicana and Las Vegas Blvd. This will be my morning run route. I didn't start from your starting point as I am staying at The Venetian, but I really enjoyed running along the Strip! I ran as a solo female runner and felt very safe-there was a good amount of people out, even at 5:30 in the morning. There was no shortage of things to look at and the pedestrian bridges definitely added a challenge to the run! I did 6 miles total, 2 down and back heading south, and then 1 up and back heading north. Thanks for this post! It gave me good guidance. Your route map isn't displaying anymore. Can you put it up again? Seems to be working fine now. Have a good run, iCruiseUF! Highway Call adventure travel book!